Khal Drogo’s Arakh will start shipping next week. If you’ve moved or otherwise need to change your shipping address. Please EMAIL us. Simply changing your address on our website will not fix old orders (only future ones), existing orders need to be manually updated. Also you may start getting shipping confirmations this weekend, we’re just preprinting labels. No swords are likely to actually go out until Monday or Tuesday. Also, we’re unlikely to get through all the preorders in a timely fashion because we’re closed half of next week for Motor City Comic Con, but we’ll do our best. We have placed a holdback show edition Damascus Longclaw on eBay, you may bid here. 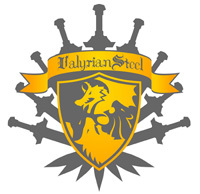 Oathkeeper and Jaime’s Sword are now shipping to customers. We expect the Khal Drogo Arakh to start shipping in the coming weeks. Also in the coming weeks Needle preorders will open. Later in June or July Oathkeeper Damascus will start shipping, along with with the Lannister Shield, and preorders will open for the Oathkeeper Scabbard. Robb’s Sword is almost completely sold out, we’re approaching finger counting range on it. Once it is gone we will not be making more. King Robert’s Warhammer will be next after Robb’s, we have enough to last a couple months, maybe…it depends on what sort of last minute sales spurt we get, it could be sooner.